I began with a Katadyn Hiker Pro Water Filter, but after fumbling with all the hoses and then the realization at how much it really weighed, I decided to try a different route. So I picked up some Aqua Mira Drops, a Gatorade bottle and some “soft bottles” and set out. Turns out, I really liked this system. For me, it was easier to use and much lighter weight! But then, my attention was turned towards some light-weight filters. One of these filters was the Aqua Mira Frontier Pro. This is a lightweight filter, however, this filter is not to be used as a “stand alone” filter. The Frontier Pro will filter down to 3 microns, which is said to remove “99.9% of Cryptosporidium, Giardia and other contaminants.” With this in mind, this filter is a great addition to chemical water treatment set-ups. So, I gave in (naturally). I picked up one of the Frontier Pro filters for less than $20 (on Amazon.com). I also decided that since I was indeed adding a little extra weight back in, I would also pick up some of the MicroPur tablets. Twenty of these tablets weigh in at 0.5 oz in the packaging. When I compared these to the 3+ oz Aqua Mira drops, the tablets easily brought the overall weight back down. Here is a quick video I did while on the trail in which I briefly run through the items I used. 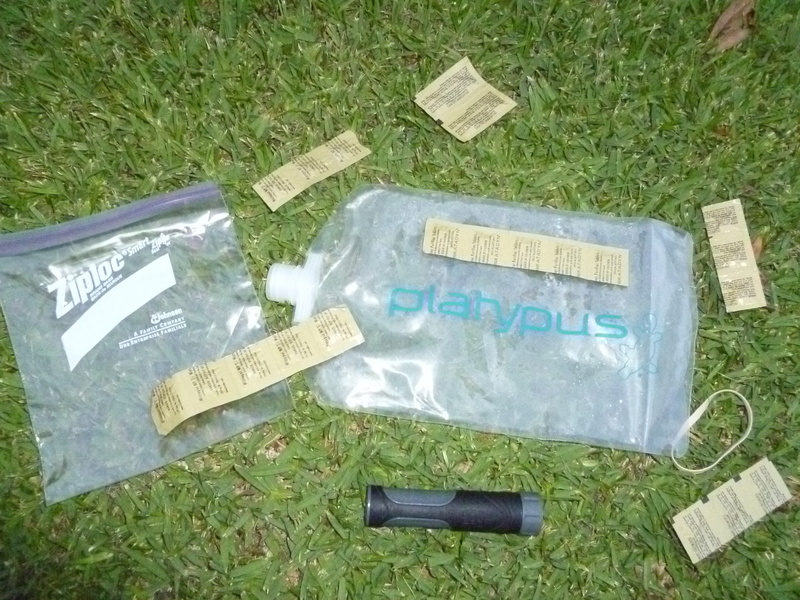 So, as seen in the video, the other items that I used with this water system included my 2L Platypus soft bottle and of course my 32 oz Gatorade bottle. Also, since the opening on the Platy is small and would make it difficult to fill with water, I carried along a 1 qt Ziploc bag in which I scooped water up and then poured it into the Platy. Once I poured the water into the Platy, I simply dropped the tablets into the Platy and let sit for 15 minutes. Next I simply screwed the Frontier Pro directly to the top of the Platy and then turned the Platy upside down and let the water filter through the filter and into my Gatorade bottle. Easy-peasey. I like the fact that this set-up puts me more at ease about actually removing or killing everything in my water. I also like the overall weight of this system. I don’t mind waiting the 15 minutes for the chemicals to work in the water. On my past trip I typically filled the bladder with 2 liters of water, treated it and then poured 1 liter in my Gatorade bottle. This way I would have a liter ready for when I needed it. And I needed at least 2 liters with me on this past trip. As far as the tablets, I found that the tablets will leave a strong chemical taste to the water, If I filter the water after using the chemicals, there is not a chemical taste, however, when I let the chemicals work overnight and did not filter the water the next morning, the chemical taste was quite strong. Good thing I was gulping it… In my experience, I have not found the Aqua Mira drops to have a chemical taste, even when not filtering. Due to this, I do not think that I will continue to use the tablets unless I plan on using a filter along with it. Overall, I think that it was a success. I may try repackaging the drops though and still carrying those over the tablets, but I will see. I of course plan to finish using the remaining tablets, so who knows, I may change my mind with them too. I also need to figure out a way to use a prefilter with the Frontier Pro and the 2L Platy. But anyway, I liked it pretty well. It is worth bringing along again and trying out. So, until next time, thanks for reading! This entry was posted in Gear, Water Stuff and tagged 2L Platy, Aqua Mira Drops, Aqua Mira Frontier Pro, Crypto, Drinking water, Gatorade Bottle, Giardia, Hiking Backpacking, Katadyn Hiker Pro Water Filter, MicroPur Tablets, Platypus Bottle, Soft Bottle, Water Filter, Ziploc Bag. Bookmark the permalink. In regards to all my setup, I only really lack a water system of some sort. A couple of my friends use the Katadyn Hiker Pro, which is nice, but I’m looking at a lighter setup. This setup sounds really awesome that you have. Does the Frontier Pro filter do a good job in clearing the water and cleaning out the silt? The FP will filter out the sediment, however, I would be pretty skeptical if I relied on it for lots of murky water. They do send prefilters which would probably help greatly. So far the water that I have filtered out of it has been fairly clear, with a light brown tint to it. You can sorta tell the quality of the water I was using by looking at the water in my videos. I wouldn’t mind checking out the Sawyer 3 Way Inline Filter. It is only about 2 oz and will filter down to 0.1 microns, which means it should get everything without the need for the chemicals as well. Also, I believe that this filter can be backflushed so if it gets clogged in the field, it can be fixed whereas the FP cannot be fixed. Of course though, the Sawyer is about 3 times as expensive as the FP, but considering what it is, I think it should be worth it.